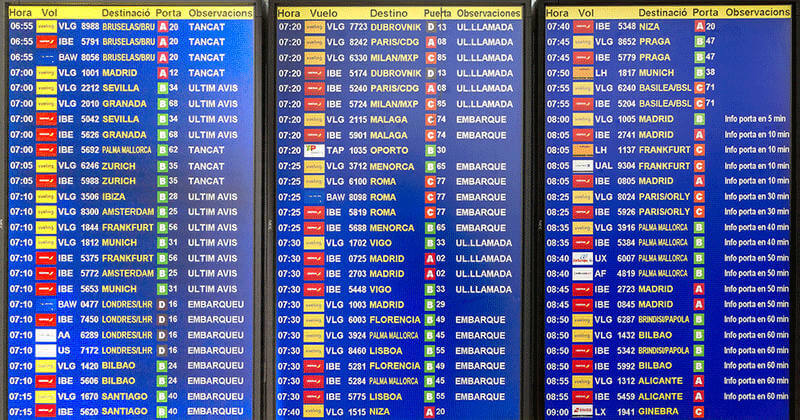 Barcelona airport has two large terminals, T1 and T2; there is no special assignment of airlines or destinations per terminal. Check in desks in T1 are located in P3 hallway; T2 is split into three check-in areas, A, B and C, the airport recommends that passengers check in with plenty of time. Boarding cards normally indicate the gate to board from, however, if this is not the case, the boarding card will indicate the boarding zone or module. There are five boarding zones in T1, A, B, C, D & E, in T2 there are six boarding zones, M-), M-1, M-2, M-3, M-4 & M-5, all boarding zones are accessed after passing through security.